The last few years have been particularly trying ones for organized labor. A half-dozen states have passed right-to-work laws since 2012, including traditional bastions of union strength in the Upper Midwest like Indiana, Michigan, and Wisconsin. Meanwhile, the John Roberts-led conservative majority on the Supreme Court has issued a steady drip of anti-union decisions, which have emboldened labor’s enemies and equipped them with a host of new weapons in their union-busting arsenal. And with the Court likely to issue a decision in the closely watched Janus v. AFSCME case sometime in late spring or early summer, the pro-business forces which have been spearheading the legislative and juridical assault have already begun sharpening their knives for what may prove to be the deepest cut yet. Tom McCabe is among those who are busy laying the groundwork for the next phase in this campaign. If you don’t happen to live in the state of Washington, odds are you have never heard of McCabe, currently the CEO of an Olympia-based policy shop called the Freedom Foundation. But it is men like McCabe, and the deep-pocketed donors behind organizations like the Freedom Foundation, who may end up determining the fate of the American labor movement for decades to come. 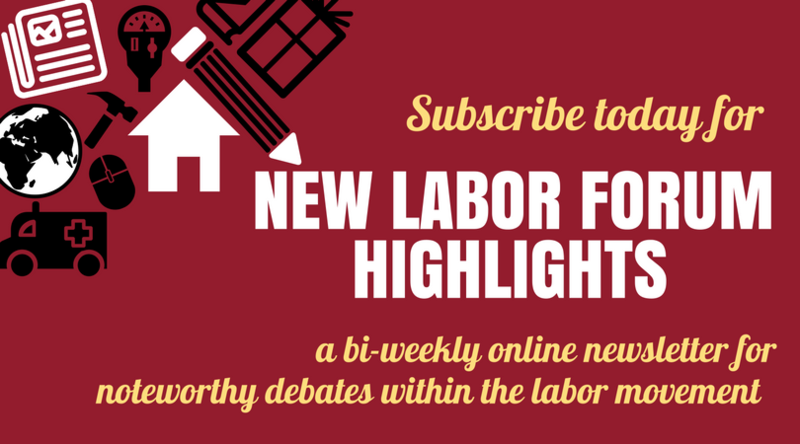 …[W]ith the Court likely to issue a decision in the closely watched Janus v. AFSCME case sometime in late spring or early summer, the pro-business forces… have already begun sharpening their knives for what may prove to be the deepest cut yet. McCabe began his political career as a low-level appointee in Ronald Reagan’s administration—an origin story he does not let you forget in his executive profile on the Freedom Foundation’s website, where he poses for a photo with a beaming grin and an arm slung around Reagan’s life-sized cardboard cutout. From there, McCabe transported his idol’s revenue-slashing, regulation-gutting, union-busting approach to government to the Evergreen State, where he spent twenty-one years at the helm of the Building Industry Association of Washington (BIAW). With a pedigree like that, it did not take McCabe long to land on his feet. The Freedom Foundation had been a reliable if low-profile lobby group pushing tax-and-spending cuts and other conservative legislative reforms in the state since the early 1990s. But when McCabe was brought in to run it in 2013, he quickly sharpened the organization’s attention on a familiar antagonist from his years at the BIAW: “the union political machine” which had long been the primary obstacle to realizing his deregulatory, free-market agenda. “There is no path to more freedom and prosperity in Washington State that doesn’t include reducing the power of big union bosses,” McCabe announced in a January 2014 fundraising call-to-arms. And after the Supreme Court handed down its 5-4 ruling in Harris v. Quinn later that same year, McCabe had just the opening he needed. In Harris—an early preview of the Janus vs. AFSCME case—the court ruled that home-based health- and childcare workers paid by the state were technically in the employment of the individual patients and families for whom they provided care. This meant that they could not be compelled to pay “fair share” fees to the unions that bargain contracts on their behalf, as is currently the case for other public employees (and which Janus threatens to undo broadly). Wasting no time, the Freedom Foundation launched a multipronged campaign to, in McCabe’s words, “bankrupt SEIU, our state’s largest union.” Throughout the spring and summer of 2015, the Freedom Foundation inundated members of SEIU Local 925 with direct mail, online, and television ads, and even door-to-door canvassers, all imploring the union’s childcare providers to “opt-out” of paying dues to the local. The campaign was highly effective: According to the Freedom Foundation’s calculations, in the first fourteen months after Harris v. Quinn went on the books, roughly half of the 7,000-plus childcare workers in Washington represented by Local 925 dropped their union membership and stopped paying dues. Local 925 claims those numbers are artificially inflated, and in fact the drop-off was closer to 20 percent—but whichever the case may have been, Freedom Foundation claimed enough of a victory that it soon expanded the campaign to target home health aides and childcare workers in California and Oregon as well. McCabe, who likes to invoke the First Amendment and the rhetoric of “employee freedom”, and talks a lot about “going to the mat” for workers caught in the union “stranglehold”, may be the public face of the Freedom Foundation’s opt-out campaigns. But behind the scenes it is a laundry list of dark-money heavy hitters on the right who have been bankrolling the group’s union-busting work across the Pacific Northwest. The Donors Trust and the Donors Capital Fund, two donor-advised funds that have between them distributed half-a-billion dollars to conservative causes and organizations since the turn of the century, and whose largest donors include Charles and David Koch and Richard and Helen DeVos, have funneled nearly $500,000 to the Freedom Foundation since 2011. The Milwaukee-based Lynne and Harry Bradley Foundation, which has been among the largest backers of Wisconsin Governor Scott Walker’s anti-union campaigns, has also supported the Freedom Foundation’s work to the tune of $2.3 million through 2016. Other powerful national forces in the conservative movement that have funded the Freedom Foundation include the Walton Family Foundation, of Walmart fame; and the Roe Foundation and the Searle Freedom Trust, two of the more prominent and well-endowed supporters of free-market and libertarian causes in the country today. The Freedom Foundation is also a prominent member of the Koch-funded State Policy Network, an umbrella group of more than 150 organizations pushing conservative policy proposals through state legislatures across the country; and a key supporter of the notorious American Legislative Exchange Council, which develops blueprint legislation for Republican lawmakers committed to rolling back government spending, cutting taxes, and weakening state-level regulations. 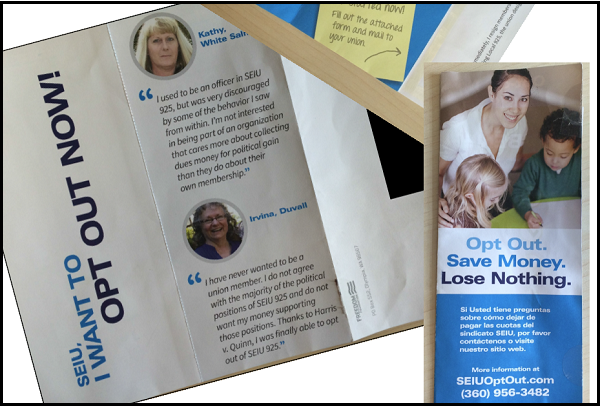 [Following the Harris v. Quinn decision] the Freedom Foundation inundated members of SEIU Local 925 with direct mail, online, and television ads, and even door-to-door canvassers, all imploring the union’s childcare providers to “opt-out” of paying dues to the local. The conservative movement heavyweights who have been funding McCabe’s work in Washington have also been reproducing the model in other states. After Michigan passed a right-to-work law in 2012, for instance, the Mackinac Center for Public Policy—the largest state-level think tank in the country, whose major funders also include the Kochs, the DeVos family, the Bradley Foundation, and the Donors Trust—launched its own opt-out campaign targeting members of the Michigan Education Association (MEA), which represents roughly 70,000 public school teachers and another 20,000 school support staff in the state. Relying on tactics similar to those used by the Freedom Foundation in Washington, Mackinac gained access to the email addresses of school personnel through a Freedom of Information Act request, flooded them with “personalized” notes about their new rights under the state’s “Freedom to Work” law, and even maintained a website to streamline the process of opting out of union membership. [The Mackinac Center for Public Policy]… flooded …[Michigan teachers] with “personalized” notes about their new rights under the state’s “Freedom to Work” law, and even maintained a website to streamline the process of opting out of union membership. As a result, between 2012 and 2017 MEA’s membership declined by roughly one-quarter, and the union’s annual dues revenue fell off by more than 20 percent. And yet even that rate of decline was not precipitous enough for the conservative activists at the Mackinac Center. In preparation for Janus—which will, in effect, extend the opt-out principle in Harris to all public sector workers nationwide—some unions in Michigan and elsewhere have begun asking workers to sign extended membership renewal or “maintenance of dues” agreements, with the hopes of blunting the effects of the opt-out campaigns. And so this past December, Mackinac filed an amicus brief in the Janus case calling on the court to not only outlaw mandatory fair share payments for public workers, but at the same time to nullify any existing contractual provisions which might stand in the way of those workers “immediately exercising their newly recognized First Amendment rights” after the decision comes down. The result, Mackinac hopes, will be an even more sudden and crippling decline in membership and dues revenues than what the MEA has experienced over the last five years. The success of the opt-out campaigns orchestrated by groups like the Freedom Foundation, the Mackinac Center, and the Center for the American Experiment…will go a long way toward determining whether or not the trade union movement will survive the Janus case. The success of the opt-out campaigns orchestrated by groups like the Freedom Foundation, the Mackinac Center, and the Center for the American Experiment, especially in relatively high union density states like Washington (17 percent, as of 2016), Michigan (14 percent), and Minnesota (14 percent), will go a long way toward determining whether or not the trade union movement will survive the Janus case. If unions are able to combat the misleading rhetoric of “employee freedom”, and reveal the campaigns to be just the latest gambit by seasoned conservative activists like Tom McCabe and the right-wing billionaires who fund them, the labor movement may be able to hold onto its last redoubt of real organizational strength in the public sector. If not, and if McCabe and his cronies get their way, Janus may signal the beginning of the end for organized labor as we have known it.